To look as good and last as long as possible, even a material as durable as concrete requires occasional repair. Concrete is tough stuff but over time, environmental exposure and wear-and-tear almost inevitably lead to cracks and crumbling. Fortunately, such problems are simple to fix. To repair small cracks, remove loose debris, first with a screwdriver or chisel, then with a wire brush or broom. 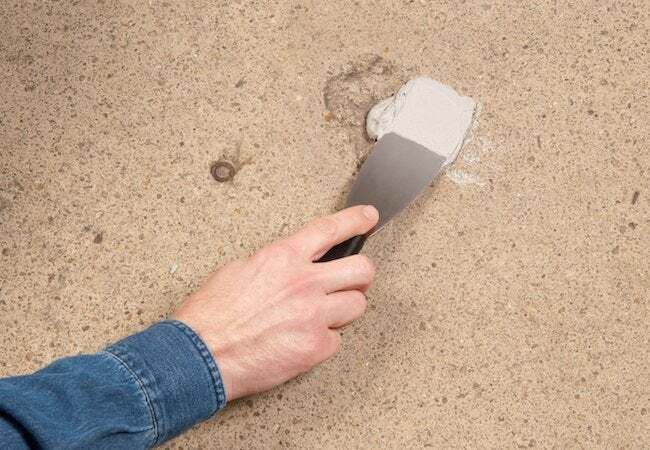 Next, fill the crack with concrete patching compound—you can find it at hardware stores and home centers, packaged either in a squeeze bottle or a caulking-gun tube. Use a putty knife to smooth the surface of the patch, wait for it cure, then cover the area with a layer of sealant to finish the job. What about patching vertical concrete surfaces? Use the same tools to remove debris, then moisten the surface with a hose—this helps holds the patch secure. Now proceed to apply premixed vinyl compound to the repair area by means of trowel. Once finished, to further guard against the patch drifting out of position, place a board over the patch, the place a brick over the board. Once the patch has cured, remove the brick and the board, and you’re done!